Lindsay Bernard Hall was born at Liverpool, England, in 1859 and studied at the Royal College of Art in London and at the Antwerp and Munich Academies. He arrived in Melbourne in 1892. 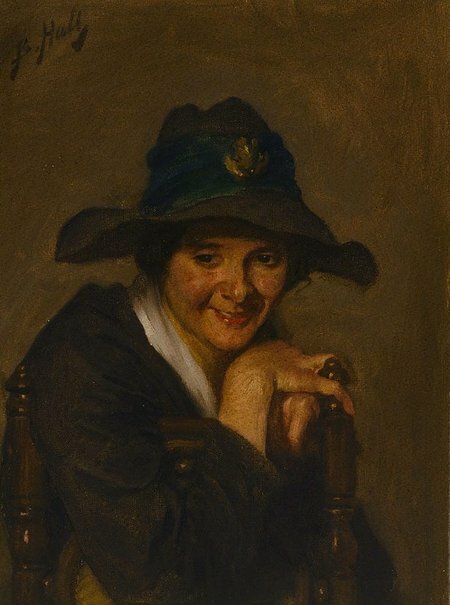 Hall was appointed Director of the National Gallery of Victoria and its Art School, where he continued the Munich traditions established there by his predecessors George Follingsby and Eugen von Guérard. His purchases for the Gallery under the terms of the Felton Bequest were both liberal and perceptive and included the masterpiece 'Boulevard Montmartre, Morning, Cloudy Weather' by Pissarro, selected from an exhibition of the artist's work held at London's Grafton Galleries in 1905. In his own practice, Hall's preferred subjects were nudes, still lifes and interiors, of which his home provided numerous views for the artist to paint. A similar painting, which also shows the distinctive mirror hanging on the wall in 'Chez-moi', is in the collection of the University of Melbourne, titled 'Dining room interior', and dated circa 1910-19. Hall was a member of the Victorian Artists' Society and regular exhibitor at the Society from 1893. Bernard Hall died in England in 1935. Signed u.l. corner, black oil "B.Hall". Not dated.